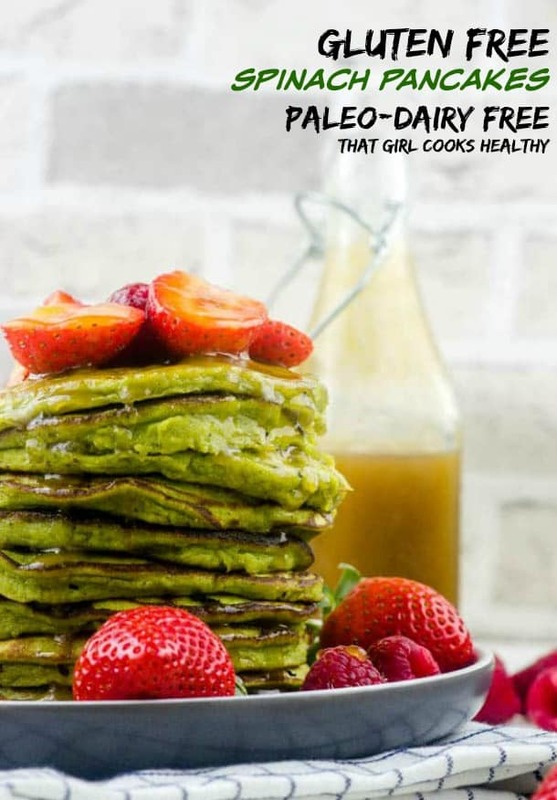 Gluten free spinach pancakes recipe – Love vegetables? Then try these kid friendly healthy pancakes loaded with leafy greens and drizzled with ginger syrup. If you’re looking to add more leafy greens to your diet, then these unique gluten free spinach pancakes are perfect. 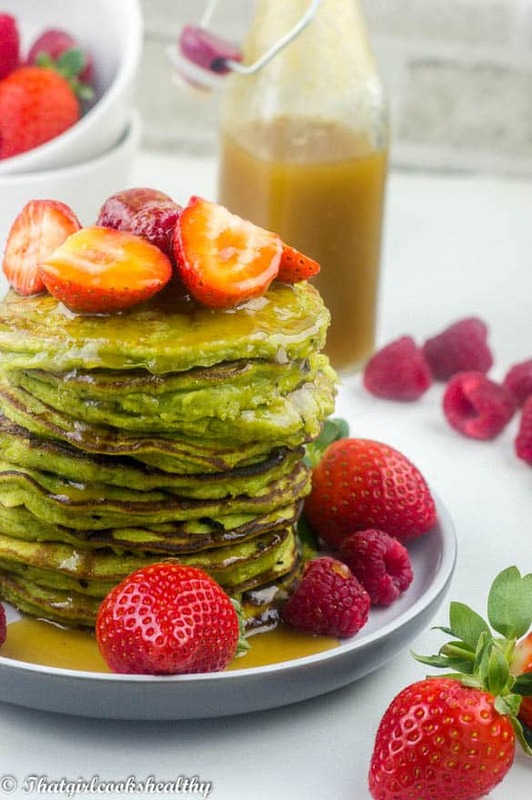 Green pancakes are a great way to sneak vegetables in so you get your 5 day. You can eat these pancakes all year round but the will definitely go down a treat for shoves Tuesdays. Children love this day because it gives them a chance to eat lots of pancakes. I remember when I was a child eating a few pancakes we made using one of those pre-made flour blends in a plastic bottle shaker. I used to drizzle so much lemon on my pancake it was unreal. Now as an adult when I want to treat myself to some pancakes I enjoy them with the form of green pancakes where some leafy greens are sneaked into the pancake batter and them with my homemade ginger syrup. These pancakes are toddlers friendly as well as child friendly. 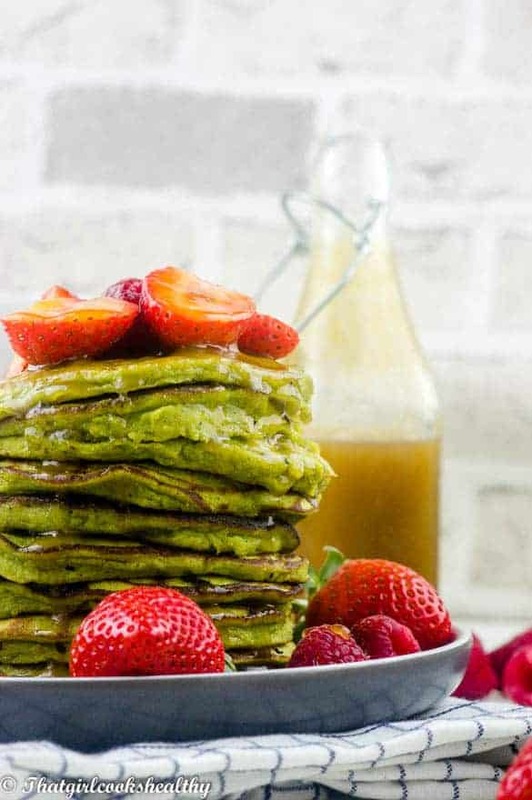 Pancakes with spinach offer so of the most amazing health benefits – high in fibre, low in fat/cholestrol, B vitamins and a good source of iron. Leafy greens – This secret ingredient will go down well with anyone would doesn’t like to eat their greens. Children are notorious for not getting their greens so mom, dad if you make this recipe – I won’t tell if you don’t! Pancake batter – You will need to make the batter using the eggs, tapioca starch, banana and coconut flour. The batter once blended should resemble a spinach puree. I made these pancakes with coconut flour so they would be paleo friendly too but they do requires a lot of moisture hence why I used soooo many eggs (that wasn’t a typo). Extra moisture – The moisture comes from the eggs and semi ripe bananas. 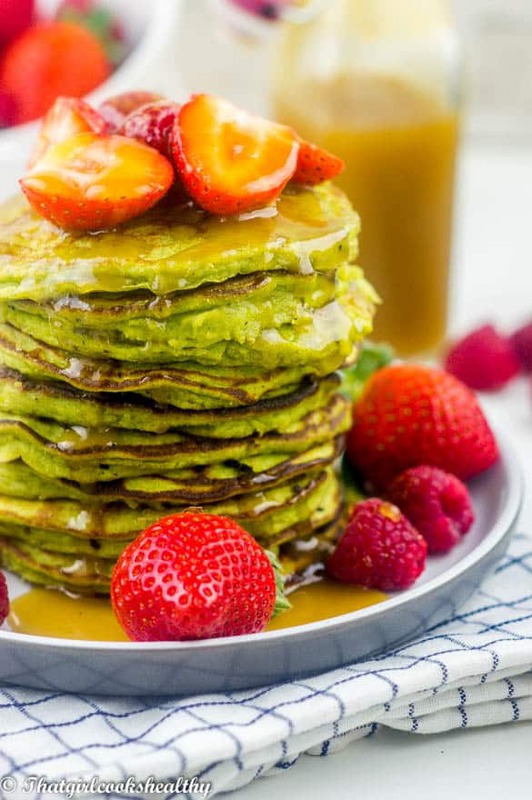 I’m not very keen on a strong banana taste in my pancakes so by using semi ripe – green slightly yellow this makes the perfect the structure while balancing out the taste. Ladle the batter – I would recommend using a crepe pan along with a ladle to pour some of the batter onto the pan. You don’t need a great deal and thickness is entirely up to the individual. 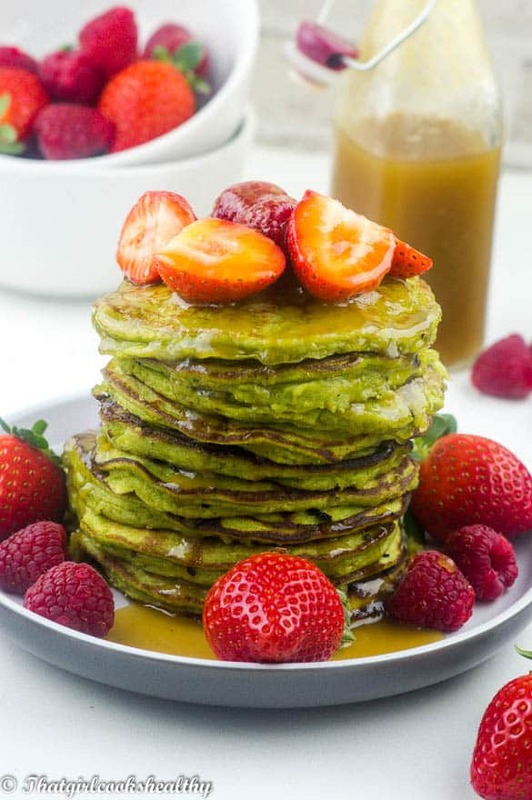 Although the pancakes are green in colour, you should still be able to tell that they have cooked because the will permeate a golden hue, just flip them, cook the other side and repeat. Other variations of spinach pancake include….. The texture of these spinach pancakes are more like a pancake/fritter if I’m honest but equally as tasty. You can crack up the protein power by using eggs whites alone and omitting the yolk. If you want to try your hand at vegan spinach pancakes simply use 4 bananas in place of the eggs. Kids and adults with go crazy for these gluten free spinach pancakes – paleo friendly! Place, the coconut flour, tapioca starch, eggs, banana, spinach, vanilla extra and pink salt in the blender. Puree the ingredients into a smooth batter. The batter should be thick and lump free. Melt some coconut oil on a crepe pan on medium heat. Ladle some of the batter onto the pan in a small circle. Then allow the first side of the pancake to cook through. It should be firm with a dark/golden hue coming through the green hue. Flip the pancake over and cook the over side. Repeat the last 2 steps using the rest of the batter. Once done, decorate with fruit and drizzle with ginger syrup. Spinach pancakes! Who would have thought they could look so delicious! I’ll have to try this recipe soon. What a delicious spin on the usual pancake recipe. I’ll certainly have to give these a try! Very interesting! This sounds like a great recipe! I love banana taste, so I’m thinking I will use more ripe bananas. That ginger syrup sound so amazing! Thanks Danielle. Yes you sure can use ripe bananas, it’s all about your preference! What a cool idea for pancakes!! These look so healthy and delicious! They are healthy and thanks Liz. Love the bright green color! Wouldn’t have thought myself about using spinach to make pancakes but will be trying it so thanks for the inspiration! Aww thanks Julia. By adding spinach it’s another way of incorporating leafy greens into our diet. 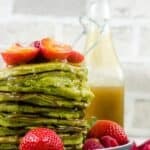 I’ve never thought of sneaking greens into pancakes – brilliant!